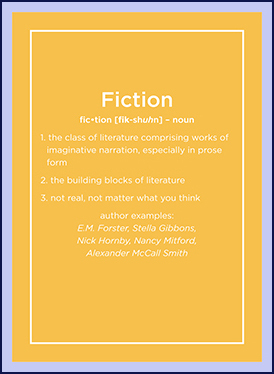 Fiction is like the umbrella or tent pole under which almost all other imaginative writing falls, sometimes even biography if we're being honest. So be it science fiction, fantasy, romance, those are just the species under the genus that is fiction. Therefore I could claim that fiction is my most read genre... which isn't actually true, but you get what I'm saying. In fact, in my mind bookstores often just throw a book in fiction if they are at a loss as to where it should go. In my mind Diana Gabaldon should be romance and Gregory Maguire should be fantasy... but do bookstores listen to me? No. Which is why sometimes, yes, I will move the books around while muttering under my breath. But usually only in used bookstores because they don't have computers that would thwart my plans. Oh, and I ALWAYS turn books I love face out. But enough about me and my weird bookstore quirks. I've chosen what I hope will be an interesting cross section of fiction, a little classic, a little modern, and all worlds to get lost in.